Fight Hunger Foundation’s health centre in Govandi has screened 13,000 kids; 200 being treated and fed for free with support from Dawoodi Bohras. Farzana Sheikh woke up on Friday, promising herself to take her son Asif to the neighbourhood health centre. 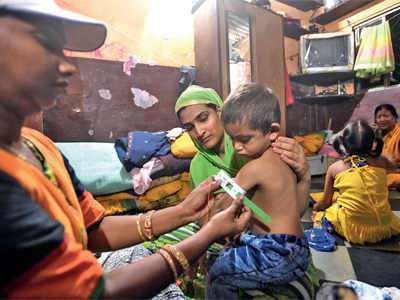 Run by Fight Hunger Foundation, an NGO that works closely with the Dawoodi Bohra community to treat children suffering from malnutrition, the health centre was the first to screen four-year-old Asif during a doorstep survey conducted four months ago. Asif was diagnosed with severe acute malnutrition (SAM). After months-long treatment, his weight has increased from 8 kg to 9.5 kg. Talking to Mirror, mother of four children Farzana said, “For four years my child was bedridden. He was always sick. We showed him to various doctors but no one diagnosed him properly. I am so thankful to the NGO and the Bohra community for providing help to my kids.” Farzana’s husband is a rickshaw driver and can hardly make ends meet. Running a family of six certainly doesn’t include fruits and vegetables for them. Like Asif, many children in the Govandi slum suffer from malnutrition. In 2016, Fight Hunger Foundation started a health centre in the area and has screened 13,000 children since then. Of these, 200 have been diagnosed with SAM. According to the foundation, one in every four children has low weight for his height, while every other child has low height for his age. To fight malnutrition, the NGO enjoys prime support from Dawoodi Bohra community. Last month, the community launched a project called Project Rise, an ambitious food assistance programme undertaken in partnership with Fight Hunger Foundation. As part of this programme, the community has adopted 100 children suffering from severe malnutrition. The main part of the project is to raise health and nutrition levels of children suffering from severe malnutrition. Sadiq Jamaludin from Dawoodi Bohra community, who looks after the Govandi programme, told Mirror, “His Holiness Dr Syedna Mufaddal Saifuddin, head of the Dawoodi Bohra community, lays great emphasis on the need to show kindness to the less fortunate and help those in need.” Jamaludin said that the community has vowed that no child will die of hunger or malnutrition. “It’s ironic that so many children die of hunger in this financial capital of the country. The Dawoodi Bohra community is convinced that all of us can, and must, do more to reduce child mortality and preventable diseases,” he said. Govandi, a slum with a population of 58,000, is situated next to the Deonar dumping ground, a hub of health disasters. “Children living in Govandi are most susceptible to infections due to their proximity to the dumping ground and the associated air pollution. It is not just about treating children suffering from malnutrition, it’s also about educating families about the need for nutrition and hygiene,” said Yusuf Mukarram, one of the members of the Project Rise programme. “Our volunteers regularly visit the community and counsel families to adopt hygiene to save their children from various infections,” he said, adding that even madarasas in Govandi adopt hand-cleaning programmes.